the forthcoming undergraduate careers conference. Establishment of a new Special Interest Group (SIG) in Macroecology. The BES already supports ten SIGs in a variety of areas ranging from computational to forest ecology. The BES provides SIGs with a platform (& funding) to connect research communities within specialist areas; examples of activities are field trips, training courses, symposia and early career researcher meetings. SIGs provide a great way to get involved with the society (I started out running the tropical group) so if you want to get involved with a specific group please contact the relevant secretary, or if you want to set up a new group please contact the society. The SIGs are as strong and active as their membership; consequently we are always keen to hear from and help out enthusiastic members to do what they want. If you have an idea for a meeting or event please get in contact. Undergraduate careers conference. 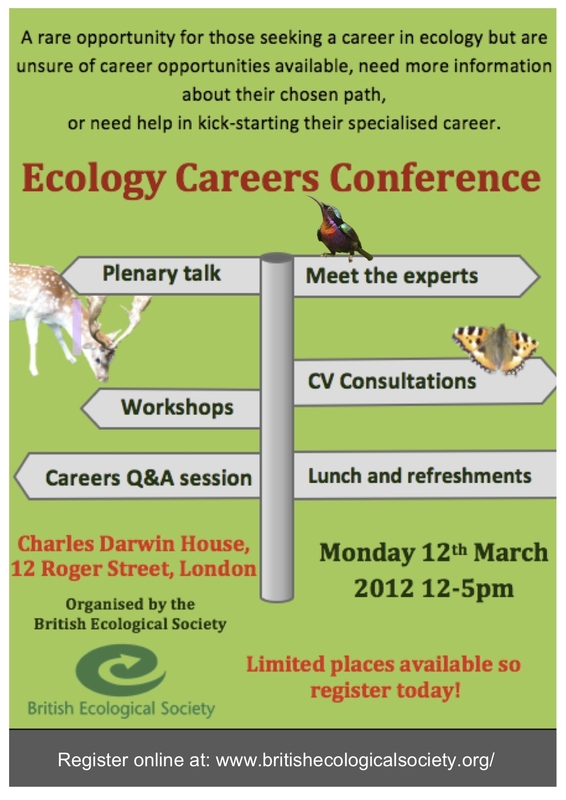 In March the BES will host the first undergraduate career fair at Charles Darwin House. The event will comprise talks from six speakers on different aspects of an ecological career (ranging from the academic to commercial consultancy). The career fair is completely booked up; however, we are encouraging people to engage via the internet. It will be possible to follow proceedings on twitter #youngeco and watch the talks on the BES web site. Visit the BES website for all the latest news and activity. Any comments or suggestions on how best to engage people through digital media welcome on this blog!